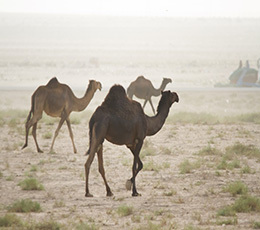 Camel grazing plays a crucial role in the desert ecosystems of the UAE. In this study, we compare areas grazed by small antelope (Al Maha Resort – the AMR) with areas grazed by both camels and small antelope (Dubai Desert Conservation Reserve – the DDCR). A total of 126 plots were selected during the growing season 2006/07 on three soil substrates: gravel plains, sand flats and sand dunes. In each plot, several vegetation parameters were assessed: density, frequency, percent cover and diversity indices. The replacement of camels with wild antelope has significantly increased the number of species on gravel plains, vegetation density on sand dunes and diversity indices on both sand flats and sand dunes, but significantly decreased plant cover on sand flats and sand dunes. The increase in species diversity in the AMR was attributed to moderate grazing by antelope. Replacement of camels by antelope in the AMR has resulted in change in plant community composition of the three substrate types. Species recovered after protection from camel grazing are palatable, especially for camels, except Heliotropium kotschyi and Aerva javanica. The absence of most of the palatable species from the DDCR was attributed to both selective foraging and overgrazing by camels.